The limbic system is the area of our brain where learning, memory and emotion are experienced. Acupuncture affects the limbic system in part by allowing the calm side of our nervous systems to emerge. This has the effect of giving the receiver a moment’s pause in the action and making healthier choices for his or herself. While we experience emotions and memories as ephemeral and therefore not material, physical matter, the fact is they are made up of actual molecules that can be isolated and identified. I find it remarkable that neural memory exists in physical space and can be built upon. Here’s how: emotions, memory, and learning are processed in a distinct region of the brain named the Limbic System, and these molecules interact with nerves. The Limbic System is a network of neurons that link the hypothalamus and pituitary gland to the cerebrum. The Limbic System has a direct effect on the nervous and endocrine systems. Memory and memorization are reinforced through repetition, which strengthens the connections into neural pathways. Emotions and sensory components (sight, sound, touch, taste, and smell) enhance memory. That is, the input of more than one sensory component and/or the stronger the emotion experienced at that moment, the greater our ability is to recall that memory. That’s why they suggest making up outrageous stories to memorize a lot of laundry-list types of facts in school: the association is stronger because of the ridiculousness. The Limbic System could be called the conscience because it processes the emotional aspects of behavior. In a perfect world, behavior and the emotions that accompany behavior are rational and in sync with each other. For example, eating when hungry, working for money, and resting in the evening. When symptoms arise that elude diagnostic testing and are classified “psychosomatic,” medical science has suggested these disorders may originate in the Limbic System. Because the Limbic System influences the nervous and endocrine systems, emotions of stress (fear, anxiety, anger) could affect the delicate balance of those systems and show up as a physical symptom. On a purely physical level, when we learn and practice a new task, these new neural connections become part of us permanently. This occurs in three successive stages as the physical memory is reinforced. 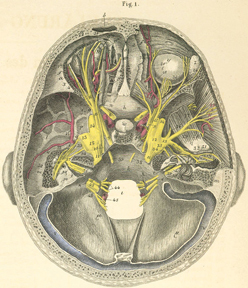 First, these new connections are stored in the motor cortex region of the brain (which receives and sends signals having to do with voluntary movement), then they drop down to the basal nuclei area (which is a deeper region of the brain), and when these movements become second nature and the task no longer requires conscious effort, the connections are stored in the spinal cord. This explains how, after a lapse of many years, a skill can be re-learned quickly, based on the previous knowledge you stored. For example, if you took musical instrument lessons as a kid and picked that instrument up twenty years later, that stored memory would help you come up to speed more quickly than if you had to learn from scratch. Similarly, emotional memory is thought to be stored first in a specific area of the Limbic System, the amygdala, which then moves to the pre-frontal cortex with reinforcement. What’s intriguing to consider is that perhaps emotions are just as malleable as learned physical behaviors, to be built upon and changed. Acupuncture has a profound effect on the nervous system and the brain. I frequently refer patients who are having difficulty coping with emotional episodes to talk therapy in conjunction with acupuncture treatment. The acupuncture helps bypass conscious thought, allowing for a different possibility, and the talk therapy provides the structure for someone to re-orient themselves towards a more balanced outlook.